This dessert is really delicious and works as a tasty option for dessert or as a power snack. As with most of my recipes feel free to vary the main ingredients for a varied finish-why not considering using mixed summer berries or some delicious gooseberries. 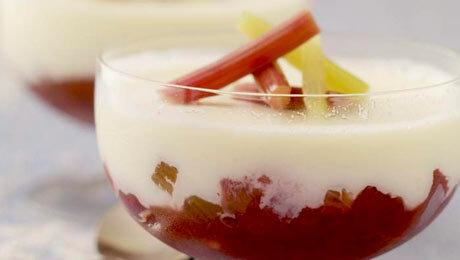 Begin by making the apple and rhubarb compote. Place the chopped apple & rhubarb into a medium sized saucepan with the sugar, ground ginger and the water and allow the mixture to come to the boil. Reduce the heat and simmer gently for 5-6 minutes, stirring occasionally, until the fruit has softened. Taste the mixture at this stage. I like to leave the fruit a little bitter but if you wish you can add a little additional sugar at this stage. Meanwhile heat a large pan. Add the porridge oats, flaked almonds and brown sugar and cook over a dry heat, stirring continuously for 3-4 minutes until the mixture crisps up a little. Drizzle the honey over the mixture, add in the sultanas and mix well and continue to cook for a further 2-3 minutes until the mixture turns golden brown. Transfer this crunchy topping to a large bowl and allow the mix to cool down completely. Place some stewed fruit at the bottom of each glass, top with some of the natural yoghurt and then some of the nutty topping. I normally repeat this process in each glass to give an attractive layered effect. Finish with a layer of the nutty topping.